This topic has 798 replies, 141 voices, and was last updated 11 hours ago by neilnevill. Tried Tudor and omega on was going for the omega when they suggested I look at the Bremont s501. Tried it on and preferred it on my wrist but know nothing about them. Any thoughts on them ? Great watches from a guy that really knows his stuff. His second watch is a bit of a classic that goes for good money. I’ve got a PRS-30 which is a lovely piece although I do think it has a slight design issue with the pull out crown. the indices are stuck on. I thought I was losing my mind! I had to dig out my old Omega catalogues to make sure – I was sure they always had applied markers. Turns out the two-tone, white face, and complications all had applied markers (at least in the catalogues I have – I’m missing odd years in and there. I know people with the 2351.80 (blue dial, blue bezel) from the mid to late 90s and I’m sure some of them have applied markers. Some clearly didn’t, although it is really hard to tell in the pictures in the catalogues. Believe it or not, my Certina Chronolympic is forty one years old. There’s not a mark on it. Everything still works – including the nightlight. Fast forward to 2001 – my plain and clean Seamaster 120m. Well my recently purchased SMP from 1999, on the wrist now, is blue wave dial, printed indices. I’ve box and papers and had the back off in the shop, it’s authentic. Mine is the same as the first picture, except the end of its second hand isn’t orange. Not sure if it’s faded or just was always white. It occurred to me the new ceramic dials and bezel inserts won’t fade. On the one hand a 50 yo watch that looks like new is awesome, but as an owner of a beautiful patina’d 1961 seamaster too, or seems a shame watches won’t age that way! I can’t find my 1999 seamster catalogue unfortunately so I can’t help with the end of the second hand. The years around it that I do have all show red. I’ll keep looking though. I miss the tritium inserts that when a nice shade of orange as the aged. The suoerluminova seems like it stays pale green forever. I suspect the modern paint is really good and won’t fade anytime soon. Probably doesn’t even have lead in it. Can you educate me on lume? Old lume, radium and tritium was always on, same brightness, faded with the half life of the radioactive element…. Basically gone in 40-50 years. Modern luminova, and superluminova is totally different, charged up by UV? It’s brightness fades over hours but it’s life is what? Permanent? On other issues… what are my chances of getting on the wait list for a GMT master II? Thinking black bezel I might have a chance. What say you? Tried on a lovely Speedmaster on in my local WoS yesterday – 4 years interest free makes it really tempting! Still find it surprising that used ones are advertised for not much less than new – do they hold their value that well? Re:lume. Afair tritium and the like have a half life of ~ 10 years. (Tritium tubes are different) Need no light to charge but when they are gone, they are gone. Except that the tritium was a mix of tritium and e.g phosphor, which is why it didn’t need light. The tritium excited the phosphor which glowed. The tritium destroyed the phosphor over time so depending on the exact mix you will find some old watches don’t glow at all (the tritium has died and destroyed the phosphor) and some the will glow faintly if charged by light but not last very long (tritium dead but some phospher left). I have a 60s seamaster like that. Luminova/Superluminova. Theoretically lasts “forever” (doubt it but maybe as long as I’ll ever know about). Charged by any light sun or artificial. Can be had in different colours. Way brighter than tritium but only lasts a few hours after a good charge. Some is better than others but not sure why. many years ago I used to wear my late grandfather’s watch whilst at school. Don’t know what was used to lume the hands, but it was more radioactive than the little lump of alpha wave material which used to come out of its wooden protective case during physics lessons. The geiger counter would go mental when I went close to it ! Radium, tritium are both radioactive. I guess that’s why the nanny state has banned them. “Mercury football” that was fun. That’s were you flick Mercury at other Mercury and try to make the biggest ball hit your mate. Re: Luminova/SuperLuminova – given a good charge from a nice bright source, like an LED flashlight, for maybe a minute or so, my SPORK will still be readable six or seven, maybe eight hours later. Tritium vials, obviously, will be bright as long as it’s dark enough to be able to see the glow; there is a caveat with Tritium vials – different colours are ‘brighter’ than others, due to the human eye’s sensitivity to certain wavelengths. Green seems a lot brighter than blue or violet, or red and orange, for that matter. 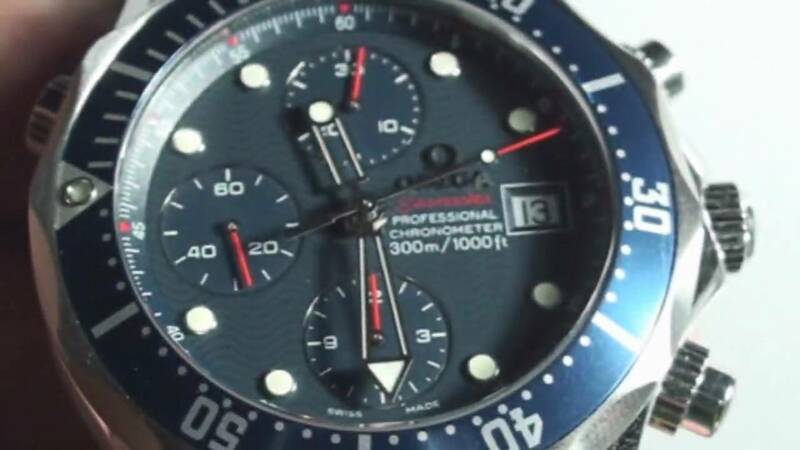 As far as watch dials are concerned, I would guess that Tritium markers could be replaced once they die: I would hope so, there are some fairly pricey watches with Tritium markers and hands, like Ball, the American maker. Personally, I think I prefer Luminova. Yes I’ve read of tritium lume being redone. jerrys, tritium is a beta particle emitter. stevemorg, speedmasters I’d expect to drop as you walk out the shop…20% vat…maybe more, then after that not drop so much. Not an expert on speedy’s though. Oh if you like speedys, be aware that servicing a chrono is considerably more expensive. Spoke to a guy that just got his back from Omega…that lifted his wallet for £850 iirc. I know there are places that will re-lume a dial and there are places that will sell kits so you can do it. I don’t know of any that definitely use tritium. In a lot of places you would need a licence or approvals to do so. I do know that some re lume places use dye to create luminova that is the correct colour for the age and original type of lume. The radiation emitted by the markers shouldn’t escape the watch case. In fact the alpha particles (I think) won’t penetrate a piece of paper). It does emit radon gas as it decays, which will escape the watch case. Alpha particles are big, a helium atom minus electrons. They are easily stopped as they are big enough to hit things, card is enough to stop them. Beta particles are smaller, an electron. I seem to remember they will go through card and other materials but not much. I suspect a metal watch back will stop them, a hesalite( acrylic) crystal might also, or might let a few through. I had a Luminox which had tritium vials and they would replace the vials after some years – 10 iirc however the watch itself (named NAVY SEAL!) got scratched up and it leaked! Not impressed generally but the tritium was lovely at night. In my continuing experiment I just dashed to Wempe on New bond Street and asked about a GMT black bezel. I was told they do not operate a waiting list. I asked if I could express my interest and they happily took my details while clearly stating they made no commitment. @neilnevill – I don’t get it, are you waiting for your Pretty Woman shopping moment? I can’t imagine there being any issues with Tritium vials, they’re readily available for all sorts of things, like for night fishing. I’ve got a flashlight with ten vials set into recesses to make it easy to find in the dark. I ordered them from eBay. The company who make SuperLuminova sell kits for people to repair or refurbish or customise watch dials and hands. @neilnevill there seems to be any number of the usual suspects online who have them available and ready to ship. If you don’t want to go that route, I would have thought developing a relationship with a smaller AD might serve you well. Sealed vials, no. Watches that use vials are a relative minority I think. Most have painted dots. Tritium in loose powder or paint form is difficult to get and is what requires a licence or approvals to use in most jurisdictions. cromolyolly, smaller AD may indeed be worth a go. i work in central london just off victoria so its easy to visit he west end ADs. if i’m near a smaller one i may go in. i quite enjoy looking at nice watches and talking watche for a few minutes so it is no hardship. this evening i had time to kill before the match at wembley so i walked up to new bond street, was quite nice. passed Aspreys on the way to wempe….they’re next. I’m trying to remember the London watch place that used to advertise a lot in the vintage car magazines – I’m sure they had Rolex and Omega but that seems unlikely because I don’t think I’ve ever seen one place that did both. Watches of Switzerland have both, mappin and Webb used to but have transferred all Rolex too WoS (same chain/holding company… Err Goldsmiths too?). Bucherer? Do they do more then Tudor and Rolex? Looking on Rolex website the London ads are Harrods, Wempe, pagnells, asprey, Bucherer and WoS (they also list mappin even though they don’t). Tbh Wempe could have had omega, I didn’t look, just in, spoke to the nice sales rep, gave my details and left.. Wasnt even offered a drink and I fancied a cuppa so was slightly frustrated. That always happens to me…. Offered drinks if I’m in a rush or for whatever reason can’t accept, fancy something I’m not offered! Slightly ot, but used some PolyWatch on the scratches on my Rolex glass yesterday, very impressed with it. Seemed to buff out all the marks and cheap to. There is also the ‘Rolex Boutique’ on New Bond St also, down the bottom end. I’ve not been in but might take a peek next weekend when i’ve got some time. Isnt that Bucherer? I’m not sure. There are plenty of others that sell them pre owned, but those are the only ADs according to the Rolex website. Slightly different tack – what do folk think of the smart straps for automatic watches that are starting to appear? Sony Wena ( https://www.thbaker.co.uk/wena-by-sony/ bad name, high price, but they will get cheaper) and the like. I’m not sure. Interesting, but not interesting enough to get my hand in my pocket. Interesting idea, but the construction of those bracelets looks doooooggggg cheap. Lots of forged metal with the mold lines visible, yuck! Looks like a Stanley knife ha. Don’t know if it was just omega or the whole swatch family. If the latter you wouldn’t have much in the shop! So for me they are a non starter. Interesting idea though, if you have a watch you like but would like a smartwatch. My other issue would be that part of what makes a watch good for me is that the bracelets are really comfortable. Exactly my attitude as well. I have a phone to do all the smart stuff, including lots of stuff a watch can’t do, like be an ebook reader. I wouldn’t be the slightest bit interested in a smart strap, for the same reason. Lost interest in smart anything after I got a mailshot from IWC this evening. Ahh I assumed it was Bucherer after dong similar, look up the knightsbridge one on google maps and click the website link and it goes to bucherer. Actually i wonder if it is run as as separate entity, with separate ‘lists’ to the nearby ‘parent’ shops? Obviously a WoS in London will have a separate list to a WOS in birmingham but what about the knightsbridge, regent street and brompton street WoS? would they operate 3 separate lists, or 1 combined? hmmm. then add the boutique into the mix. After flippantly dismissing diving watches here I have been doing a bit of research. I am biased but my new found love of Russian watches would lead me to the Vostok Amphibia if I was in the market for one. Described as the AK47 of dive watches, a distinct and robust design with a face perhaps only its mother could love and a terrible strap for a one off payment of £50 against the pretty handmade Rolex Submariner combined with second mortgage. Paid £10 extra for a Saturday delivery so tonight is another Christmas Eve for me!